JTEKT's Koyo brand manufactures a large range of deep groove ball bearings. 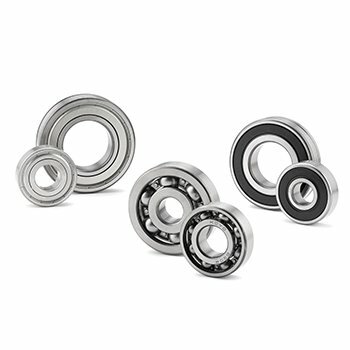 They are available in a variety of sizes, and are the most popular of all rolling element bearings. This type of bearing supports radial and a certain degree of axial load in both directions. Available as an open type, shielded / sealed types, and the flanged type. The latter is easily positioned in the axial direction. These bearings are single-row deep groove ball bearings with a filling slot on both the inner and outer rings. They feature an enhanced radial load rating as they can contain more balls of larger diameter. Not suitable for applications that involve axial loading or high-speed rotation. When the bearing is installed, the filling slot on the fixed bearing ring should be in a no-load area.